Spend a day in the grounds of Waterperry House in Oxfordshire this weekend and you won’t fail to be inspired. Art in Action is an annual 4-day showcase of excellence in the visual arts where more than 400 artists, designer-makers, craftspeople, musicians, performers and lecturers come together. Disciplines include sculpture, print making, glass, metalwork and jewellery, textiles, woodwork, painting, illustration, calligraphy and ceramics. 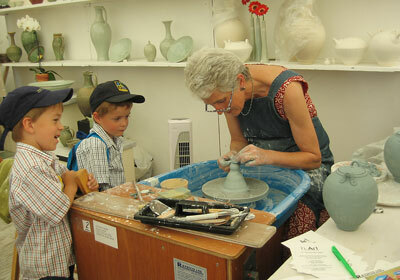 Here is fellow WGDC member, Bridget Drakeford, throwing tiny ceramic pots for my sons at the event a few years ago. 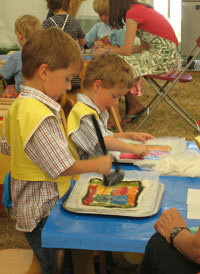 It is a wonderful place to take children as there are craft workshops, story telling tents and impressive demonstrations of glass blowing and sculpture. Do be sure to go straight to the marquee where your child’s chosen class takes place at 10.30am on the day to add your their name to the list – classes are offered on a first-come-first-served basis and are very popular. Art in Action began in 1977 – read about its evolution here. Art in Action’s Daily Event guide is here. It is open from 10.30am until 5.30pm Thursday through to Sunday. Here is how to get there. If you do get chance to visit please come back and tell us what you thought in the comments section below.